With a pair of wins over the visiting Niagara Falls PowerHawks this weekend, the PIttsburgh Vengeance have now taken over the NA3HL with the most wins by any team. With 42 points, they lead the North Iowa Bulls and the Yellowstone Quake by a single point for the overall league lead. The also extended their lead over divisional rivals, Metro Jets, to five. In Saturday’s action, the Vengeance defeated the PowerHawks 4-1. Thomas Polster opened the scoring for Pittsburgh at 12:25 of the first period, with assists coming from Simon Soderberg and Zachary Servidio. Devin Whitaker added to the hometown lead at 16:20. Assists came from Hudson Kubasek and Anthony Bates. Andrew Logar scored his 20th of the season with three minutes left in the second period to draw the PowerHawks to within one. Frankie Bodami was credited with the lone assist. Austin Martz responded for the Vengeance with only 1:48 left in the period. Jacob Friedman provided the assist on the goal. Dominick Glavach scored the only goal of the third period to solidify the 4-1 victory for PIttsburgh. Marks Mezsargs and Benjamin Oslick assisted on the power play marker. Kris Augustine made 48 saves on 52 shots in the loss for the PowerHawks. Joel De Simone turned away 24 of 25 shots in picking up the win. It was a spirited affair with 64 minutes of penalties on the evening. The PowerHawks opened the scoring for Sunday morning’s game. Spencer Hrynczak lit the lamp only 1:48 into the first period, with an assist coming from Michael Olszewski. Nick Erker answered back with two quick goals to give the Vengeance the lead. His first, coming at 4:12, was assisted by Austin Martz and Jacob Friedman. Only 20 seconds later, he scored an unassisted goal. Dominick Glavach scored a shorthanded goal at 12:16 to extend the Pittsburgh lead to 3-1. The second period picked up where the third period the night before left off with 128 minutes of penalties, including two bench penalties by the Vengeance and three ejections between the two teams. PowerHawks goalie, Kris Augustine was also replaced by Josh Mitchell in net at 2:19 after he received an unsportsmanlike penalty. James Unger’s goal for Pittsburgh at 2:19 of the second extended their lead to 4-1. Marks Mezsargs and Jeremy Jenkins assisted. Austin Martz added another goal at 4:59 to give the Vengeance a four-goal lead. Simon Soderberg and Glavach were given assists on that power play tally. Erker completed the hat trick with a shorthanded goal at 10:48. Martz was given the assist. Mitchell Thornton gave the PowerHawks a boost of energy with a pair of goals only three minutes apart in the third period. His first, at 8:01, came on the power play. His second, at 11:07, was an even strength goal to make it 6-3 with nine minutes to go. Stephen Minichiello and Matt Cavanaugh assisted on both goals. Nick Erker nabbed his fourth of the afternoon just 34 seconds later. Friedman and Martz assisted. Kris Augustine made 17 saves on 21 shots before he was replaced in the second period. Josh Mitchell stopped 22 of the 25 shots he faced in relief for the PowerHawks. Caden Shell turned away 10 of the 13 shots he faced. 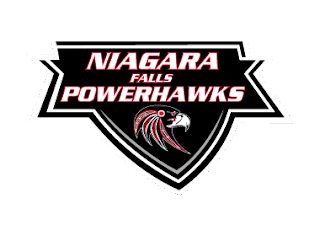 The Niagara Falls PowerHawks will be home at the Hyde Park Ice Pavilion on Saturday and Sunday, December 9th and 10th against the visiting Jersey Shore Wildcats. Game times are 6pm for Saturday and 1pm for Sunday.